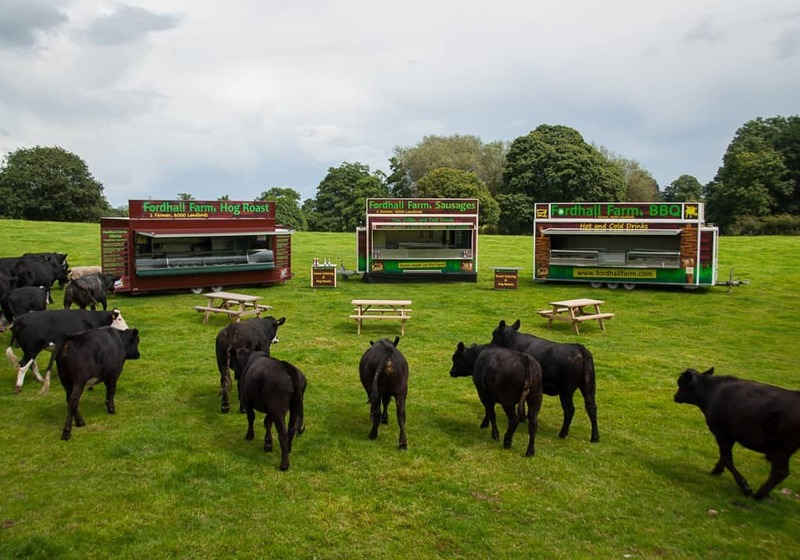 Coming from humble beginnings in 2004, Fordhall has grown into a well-recognised event catering company offering mobile catering to local and national shows and events. Our ethos is based around our core values of producing honest, high quality, sustainable food from our farm and surrounding farms in Shropshire, Staffordshire and Cheshire. Over recent years the farm has been transformed from a run-down derelict farm to a state of the art farm shop, award winning café, butchery and bakery. All of the meat including burgers, sausages and bacon used for catering is prepared on the farm by our team of highly skilled butchers. The meat itself is either sourced direct from our farm or from trusted local suppliers. We even fed Chris Evans at his annual CarFest event! You may be thinking “how can a small farm in Shropshire cope with feeding the thousands of people attending my event”. In 2011 we completed a major redevelopment of the farms infrastructure. The £500,000 project has created a state of the art production facility on the farm, where we have many different strings to our bow. Our butchers have capacity to make no less than 10,000 burgers per day – their hands can move quite fast! 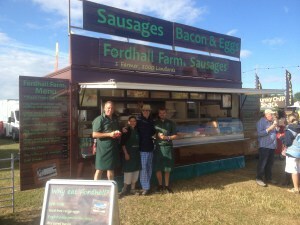 Fordhall Farm operates a fleet of high output modern catering units, with the flexibility to offer many menu options. Our catering units have the highest capacity equipment installed. All our units are wrapped and branded with the farms livery and portray the premium brand that Fordhall is. But our crucial point of difference is the quality and provenance of our ingredients, creating a catering outlet that people can trust. From our first farmers market in 2005 our catering business has grown consistently year on year. In 2012 Fordhall Farm was invited to provide the catering provisions for Her Majesty the Queen’s Jubilee visit to Shropshire, providing catering provisions for the 40,000 members of the general public descending on RAF Cosford for the celebrations. We are a young dynamic team striving for excellence in the world of mobile catering. We are proactive and continually looking to expand our portfolio of events. We can come to your venue with a Fordhall hog roast or with a decadent buffet, canape’s or a gourmet BBQ. Of course we can offer our own fields or function room (guests up to 60) for a celebration too!